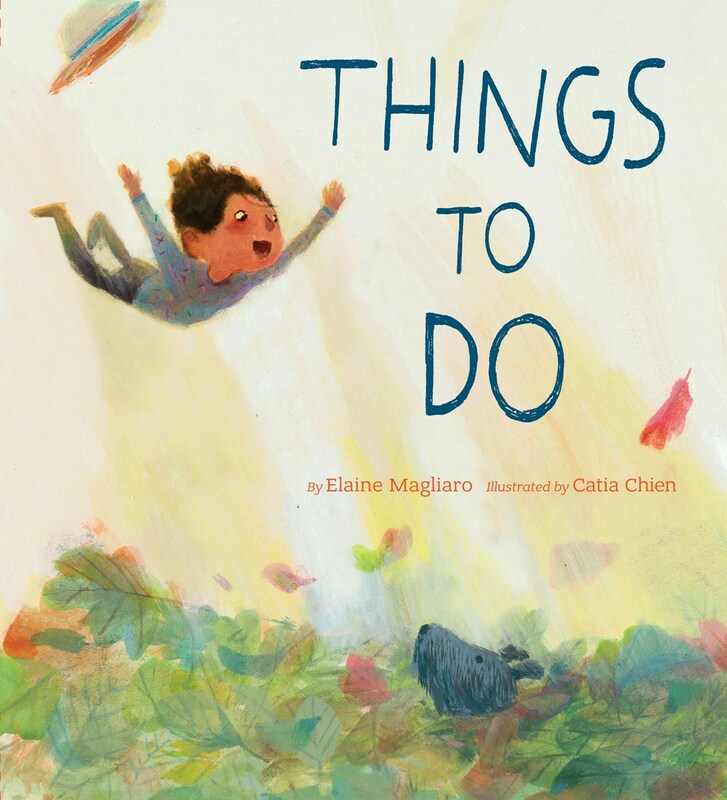 Things To Do author Elaine Magliaro shares the peaks and valleys she encountered while creating the poems for our featured picture book. The manuscript for my book Things to Do made quite a journey from its original version to its final draft. It became a much leaner poetry collection through the editing process. The original manuscript contained twenty-eight poems; the final version has fourteen. I had to leave many of my poems on the cutting room floor: alarm clock, breakfast, bus, school, pencil, noon, school lunch, spelling test, book, school bell, grass, lawnmower, bicycle, dinner, homework, grandfather clock, nightlight, teddy bear, and night. That’s a total of nineteen poems to which I bid farewell! Just nine of the original poems remained. I had a long road of writing and rewriting before I reached my destination. 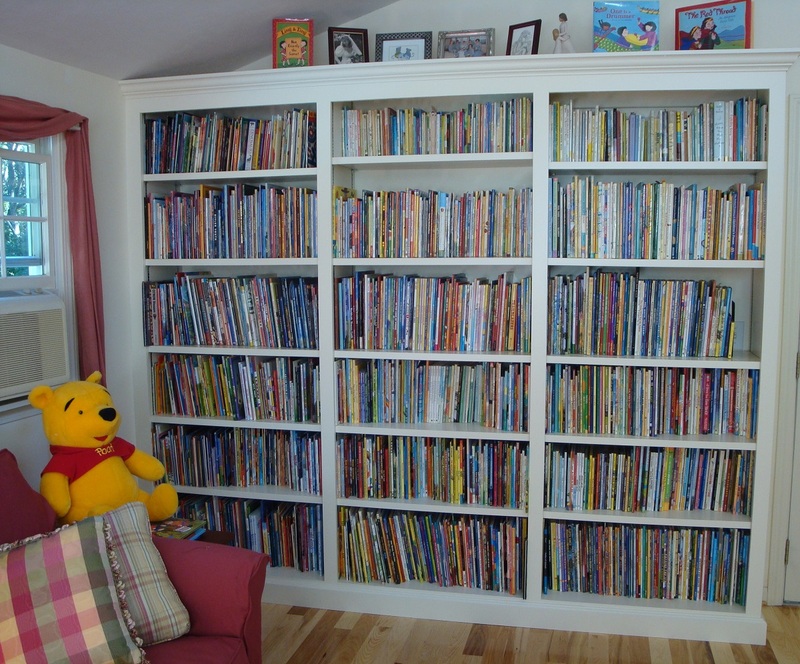 Melissa Manlove, my editor at Chronicle Books, traveled the months-long journey with me. As we also discussed, we’re going to make this text less school-age-specific. Towards that end, I think we need to think further about what our moment of small crisis is to be. I think a pet running away / getting lost is a bit too fraught for the younger readers of this book. What about losing a favorite toy –your teddy bear?– so that when it is recovered it is filthy and must endure the trial of the washing machine? (perhaps in the background we see a dog carrying it off a small way?) Small children (and older children will recall this well) hate to see a beloved toy go into the washer/dryer. 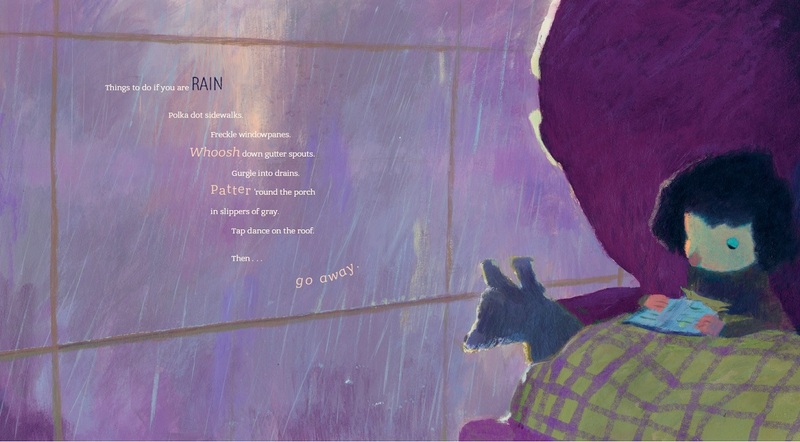 Or perhaps the toy is only forgotten in the backyard, and caught in the rain –thus your rain poem–and has to spend time in the dryer? Or perhaps you have other ideas? Oh, how I tried to make my “story in poems” work with a teddy bear scenario. I failed . . . miserably! I just couldn’t get it right. After several attempts, I gave up. I think it was for the best. After I threw up my hands in defeat, I got the idea that the “moment of small crisis” should be a rainstorm interrupting the little girl’s day of play outdoors. Fortunately, Melissa liked the idea. I then got to work writing the SKY poem, which would imply an oncoming rainstorm. It helped to move along the arc of my story in poems. Soon after completing that poem, I got an inspiration to write a poem about boots. My first draft needed no revisions—and it fit into the storyline perfectly. I had to revise some of the poems that we kept in the collection. A few had minor revisions; others required much more. One that underwent a major change was the honeybee poem, which had originally been a “worker bee” poem. Melissa thought the poem was too long. She suggested I keep just the first two lines . . . and leave the poem at that. I decided to add two new lines to the beginning. Bring along your mobile home. The wonders of your world are small. Roll off rooftops and gurgle down gutter spouts. Patter around a porch in silver slippers. Tickle tulips and glisten the grass. Look for a lost rainbow. After revision, the first two lines remained the same—but nearly everything else changed. In addition, it became a rhyming poem. During months of discussions with my editor, I wrote and rewrote . . . and produced eight different drafts of my poetry collection. I completed the final draft in June of 2012. Chronicle then spent more than a year looking for an artist to illustrate Things to Do. The journey from original manuscript to final draft to published book was a long one indeed. It took over half a decade. Along the way, I got frustrated. There were days when I thought I’d never “get it right.” There were times when I had to step away from my computer and not think about Things to Do for a while. Now, however, I can say that all of the time I spent brainstorming ideas, revising poems, writing new poems, dealing with my own frustrations, and waiting for my publisher to find an illustrator were definitely worth it. I’m proud of my book. I realize how fortunate I was to have an editor who helped me to shape my poetry collection into what it was really meant to be. When I look at Catia Chien’s artistic visions of my text and see how she breathed life into my words in such a beautiful way, I think I must be the luckiest children’s author on the face of the Earth! that makes my ears ring! and start my day off wrong. with a soft morning song. Live on a hillside meadow. and golden as summer sun. and a symphony of crickets. Be the shadow of day. Put the sun to bed and light the moon. Rouse sleeping raccoons and owls. Sprinkle stars across the sky. Slip softly away before dawn. of a spunky girl named Ramona Q.
of a boy and the Jabberwock he slew. that will let my imagination sail. or sing with sounds of poetry. a story that’s just right for me. 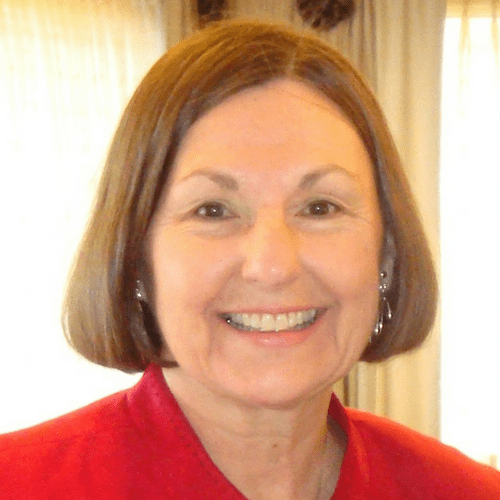 Elaine Magliaro is now retired from teaching and writes poetry for children and serves as a member of the NCTE Poetry Committee. She lives in Massachusetts. Visit her online here. This is a wonderful post and I can’t wait to have this book to savor and share!!! Terrific. So happy I saw this. 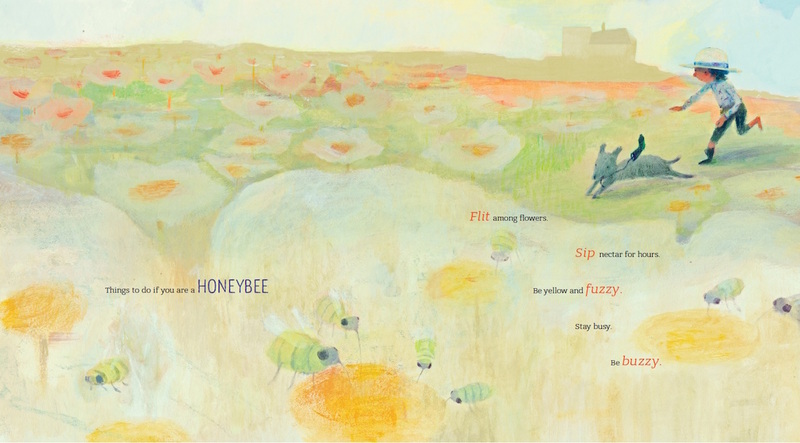 I especially love how you shared your Honeybee poem and its evolutionary journey from your pen to the book!! Hope to see you at NCTE this fall! Elaine, your book looks awesome – I can’t wait to read it! 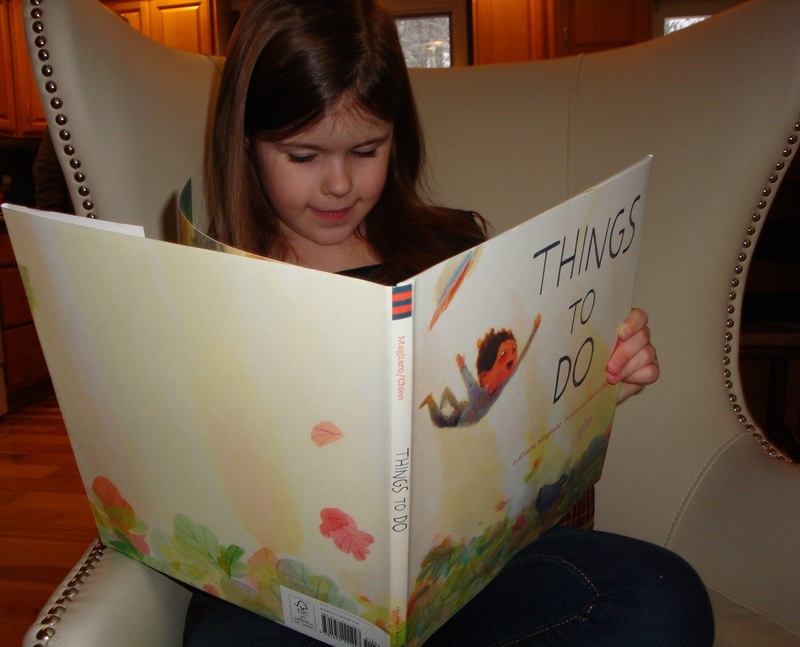 I appreciate the behind the scenes look – I’ve been wanting to write a poetry picture book so this was really helpful! Thanks! I loved THINGS TO DO, Elaine! Such a fun read aloud, with lovely language. Thanks for sharing the book’s journey :).